Give your gaming, web browsing and streaming experience a serious upgrade with dedicated PC speakers. They’re designed to deliver far superior sound to the tinny audio you often find with built-in speakers. Many PCs and desktop computers don’t come with high-grade speakers, while the built-in speakers found on laptops and tablets are often tiny and weak. 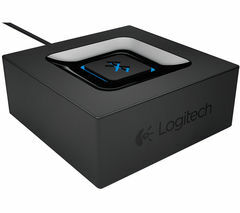 Dedicated PC speakers allow you to enjoy a serious boost in audio power, as well as surround sound capabilities. 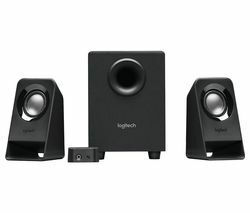 From watching movies on your laptop, to capturing professional audio sound in your home music studio or at the office, you’ll find a range of PC speakers to suit your specific needs. 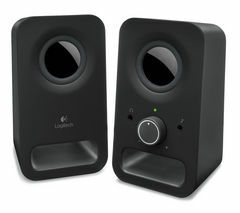 Our range of Logitech PC speakers includes 5.1 speakers to create a fully immersive surround-sound experience. 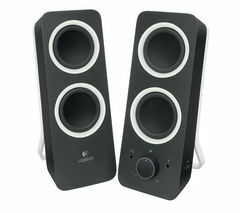 PC speakers range in power from 3W to 500W, from two speakers to five speaker systems, with Bluetooth connectivity allowing streaming from your devices without wires and cables. Subwoofers deliver deep bass frequencies you can really feel, while 3.5mm jacks mean connecting to your smartphone, tablet, MP3 player or private listening with headphones is easy. For great audio performance on your home or work PC or laptop, when gaming, listening to music, watching films and more, dedicated PC speakers are ideal. Check out our full range of computer accessories for more great computing ideas.